If yout original hero power is replaced via Shadowform or something else that doesn't make it a class hero power can Sir Finley Mrrgglton discover your original hero power, or only other classes? I believe it allows you to rediscover your original hero power. Really interesting question. After 5 unsuccessful games against Innkeeper I googled it. Unfortunately, it's impossible. Ahh, don't leave me buddy! why do the fools in this comment section like this card? All this card does is promote pure aggro decks by turning people into huntards! gonna be a sad day when Sir Finley gets rotated out. Just played a game where I am Tempo dragon warrior with no board and no cards in hand, was one damage off of lethal with his board filled with taunts. 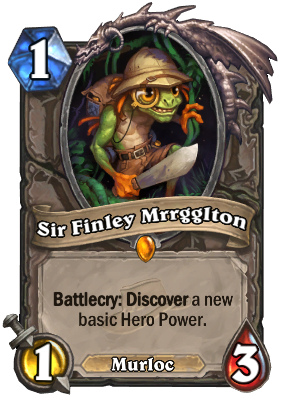 I then top deck sir finley and get mage hero power :D.
Little guy's great for many decks. Tried it with cancer secret paly and it works great. Obviously good for shaman and rogue, but also quite useful for hunter and priest. And, 1/3 body is quite alright. Question, does Justicar upgrade your original hero power or the one Sir Murloc gives you? Great card to change the outcome of a game. This card is just amazing. This card giving you the right Hero Power can straight up win you the game. Aggro Pally with Steady Shot , Mid Hunter with Druid/Mage power , Zoo with heal in late game , Fatique Mage with Armor Up! The possibilities are endless! Throw away zoo life tap? Sounds like a terrible idea. He said late game, so at that point you're going to be drawing into fatigue. The thing is, zoo in late game means you lost. Fun and great card, love the art!